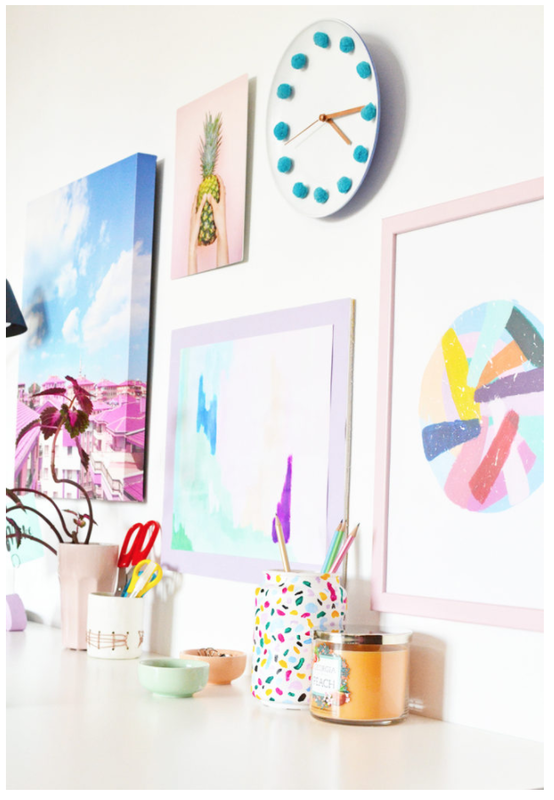 DIY & home stylist Marwa from the creative blog Enthralling Gumption, has created colorful abstract art for your springtime home makeover. With our home decor design platform, these free downloads can be used as canvas prints, posters, acrylics and more. Here in Palo Alto, California, the rain has taken a toll on us. We've been seeing grey skies and dark clouds for weeks! These bright pieces of art is just what the doctor ordered to pull us from our winter blues. Download your free art below for an easy 5-step DIY wall art project. Step 1: Click the Download button to reveal the larger version. Experiment with your space to achieve fun, bright flashes of color. These abstract designs are great to mix and match for a refreshed home, ready for spring.